Source: Lynn Abramson, President, Clean Energy Business Network, March 13, 2019. Fourteen energy innovators from the Clean Energy Business Network came to Washington DC March 12-13, 2019 to showcase their innovative energy technologies to federal and state lawmakers. All of these businesses have helped bring new technologies to market through partnerships with the Department of Energy (DOE), Advanced Research Projects Agency-Energy (ARPA-E), and National Laboratories. These entrepreneurs are working to develop the clean energy technologies that will power America’s energy future AND our economy. Fly-in participants met with Members of Congress and their staffs to discuss their companies’ work, how the DOE helped advance their technologies, and economic impacts and jobs in their communities. The companies represented at the event were all small businesses with offices, projects, and partners working across a collective 25+ states–and met with more than 50 Congressional offices during their visit. Timing for the CEBN’s fly-in is critical. The same week, the White House released a summary of the President’s budget request for fiscal year 2020, which proposed reducing the DOE budget by 11 percent and eliminating ARPA-E. The budget release kicks off Congressional proceedings on the budget and appropriations cycle in consideration of this request. L to R: Gary Cola of Flash Steelworks shows his lightweight steel to Sen. Stabenow. Jim Nash of Brayton Energy walks past the Capitol Dome on his way from House to Senate meetings. Dave Karpinski of LEEDCo, Lynn Abramson of CEBN, Guy Longobardo of Bettergy, and Jim Nash of Brayton Energy head to a meeting with the staff of the House Appropriations Committee. The business leaders participating in the fly-in also received a briefing from Mike Boots, Senior Director of Advocacy and Government Relations at Gates Ventures and former Director of the Council on Environmental Quality under the Obama Administration. Gates Ventures is a private think tank/philanthropic organization created by Bill Gates to spur changes in public policy and private investment practices to promote breakthrough developments in low-carbon energy technologies. Periodic updates are available at Gates Notes. Mike Boots of Gates Ventures briefs participants on Bill Gates’ personal interests in energy innovation policy and technologies and the work of the Breakthrough Energy Coalition. 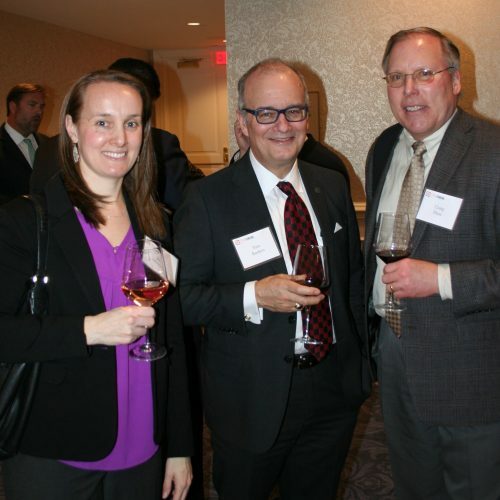 L to R: Jen Derstine of Capstone Turbine Corp., Tom Ranken of the CleanTech Alliance, and Craig Husa of SuperCritical Technologies recover from a busy day at the networking reception. In addition, thanks to the efforts of Citizens for Responsible Energy Solutions (CRES) Forum, fly-in participants also joined a networking reception, enabling the business leaders to share their stories with a range of conservative local and state policymakers, DC Governors’ offices, agency officials, and leaders from 12 state chapters of the Conservative Energy Network (CEN). These conservative policymakers and stakeholders were in Washington for a concurrent fly-in organized by CRES Forum and CEN bringing in Republican clean energy advocates and appointed state leaders to speak with Republican members of Congress about local support for the clean energy economy. CEBN members also participated in a handful of joint meetings with CRES and CEN. This fly-in is just the beginning of the CEBN’s work on energy innovation in 2019. Throughout the year, we look forward to working with all our CEBN members to make your voices heard on critical issues impacting energy innovation. Stay tuned for circulation of our group sign-on letter on appropriations, and if you need assistance completing appropriations request forms for your Members of Congress, we can help you navigate the process. We hope to organize roundtable discussions enabling you to share your views on how the public and private sectors can more effectively support entrepreneurs. And we will provide additional opportunities for you to participate in advocacy and education, network with investors and corporations, and learn about resources to help your company succeed. The CleanTech Alliance is a trade organization driving clean technology innovation and job growth to advance our economy. It was founded in Seattle in 2007 and now has 300 members in ten U.S. states and three Canadian provinces. Members represent many different industries, business models, technologies and services all working to create products and services that are better, faster, cheaper, cleaner, and safer. The CleanTech Alliance can speak to the landscape of energy innovation across the Pacific Northwest and examples of how companies in the region have partnered with the DOE and Pacific Northwest National Laboratory to develop and deploy new technologies. Molecule Works is the innovator of a novel ammonia liquid fuels technology. The company was originally founded based on technology licensed from Pacific Northwest National Laboratory and has since received $2.4M+ in ARPA-E and SBIR awards to support further R&D. Products under the Molecule Works portfolio include porous metal sheet, thin-sheet zeolite membrane, and flat-plate membrane module inventions. SuperCritical Technologies builds compact turbine generators that use supercritical CO2 in place of steam. At about 1/100th the size of the equivalent steam turbine, this technology opens up potential applications in small-scale biomass plants, waste-to-heat power, and remote power generation. The underlying technology was developed at Sandia National Laboratory. CEO Craig Husa also serves at the helm of Impact Bioenergy, a manufacturer of commercial-scale, modular bioenergy systems that profitably convert food waste into renewable natural gas and probiotic plant food with zero-waste. Impact’s bioenergy systems are sized to process food waste from 25 tons/year to 1,500 tons/year for customers including large restaurants, corporate and educational campuses, casinos, and food processors.